All Around Auto is a family owned NAPA Auto Care Center and we use quality NAPA parts. 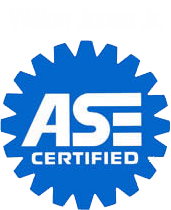 Our chief auto mechanic is ASE certified. You can bring your car to our auto repair center with complete confidence. We offer a great warranty at our auto repair shop. Our auto repairs come with NAPA’s 12 Month / 12,000 Mile Nationwide Peace of Mind Warranty. It covers the Napa Parts we install on your car. This warranty helps you anywhere in the nation at over 13,000 NAPA Auto Care Centers.